Los Poblanos Inn and Cultural Center is one of my favorite places to spend time in my yurt. The entryway swallows guests in a shady arched tunnel formed by two rows of vaulted elm trees. You are transported to the site of an ancient pueblo lost during the Spanish Conquest and replaced by an elegant complex of buildings designed by John Gaw Meem (1894 – 1938) in the 1920s, a farmstead that celebrates its vintage heritage and the roles played by the Simms and McCormick families that served political and agricultural interests before the site was purchased by the current owners, the enlightened Rembe family. 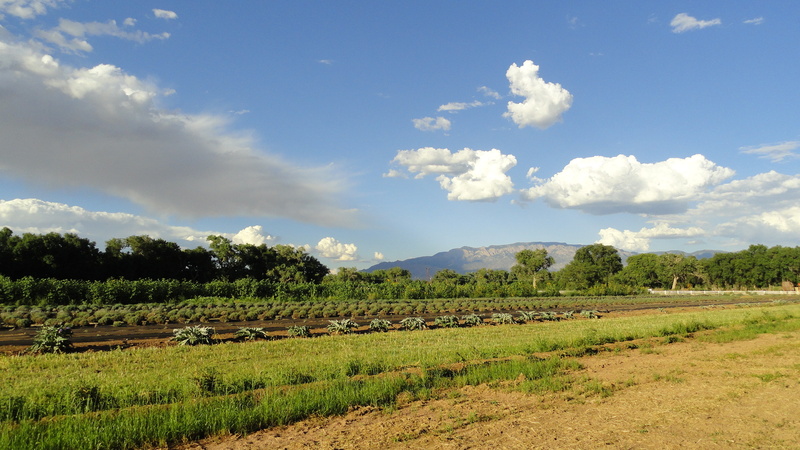 With the Rio Grande to its back and the Sandi Mountains out the front window, the site exudes a deeply pastoral energy. I swear the battery indicator on my phone went up when I arrived on site. I’ve been there twice as the Nomad. 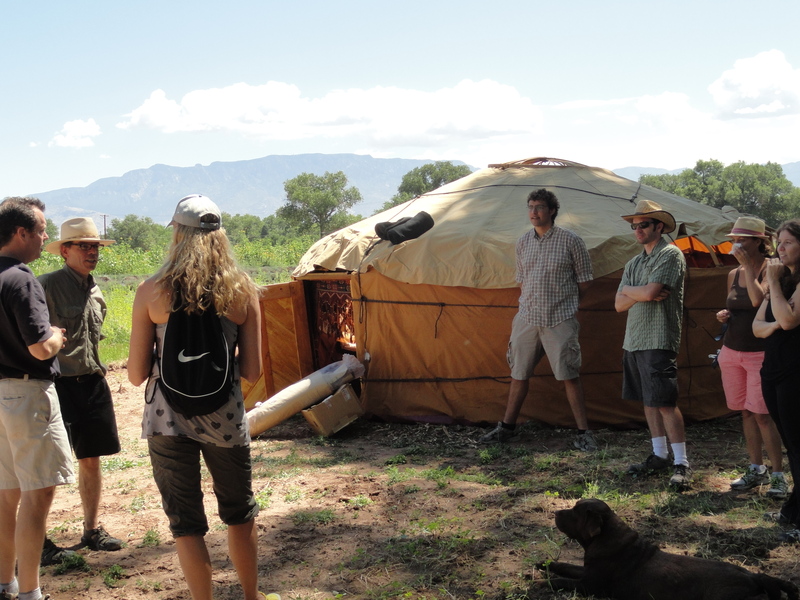 The yurt made its first public appearance at Los Poblanos in June 2010 at the Lavender Festival. On day one, an elegant Native man sauntered up and without introduction declared, “That is a Hogan.” His statement, and one the next day from a second Native visitor that “it is a sweat lodge,” rocked my world because I had labored for 200 hours to make a yurt, not a tipi, as my entry to indigenous life, for fear of treading on truly native people of North America. I was not going to repeat the cultural awkwardness of the back-to-land movement of the 1970s. Even so, my Native visitors taught me an important lesson – “we are one.” The Navajo, such as my guide on an earlier hiking trip through Canyon de Chelly, say people are the five fingered ones, to distinguish all people from other animals. Somehow I missed that, growing up in a family descended from European immigrants. The yurt has much to teach me. My second stay was August 4-7, 2011 as a diversion for the guests to enjoy. Nancy, the inn’s capable and inspiring manager, helped organize a series of informal workshops I gave throughout my stay. Guests enjoyed cookies baked in the solar oven, yogurt making with milk from the farm’s wonderful goats, and felt making with local Churro wool. Along the way I made new friends with guests and the eclectic staff. Good, old friends of all ages joined the fun too. My neighbor John and leader of our community garden took a nap in the yurt while I was elsewhere on the farm. Others just hung out for meals, pleasant conversation, and celebrated the good life. Let me share the gradual transition in my mindset that occurred during the stay, as the experience moved me from urbanized professional to authenticated nomad. As was my intent, my stay connected me more directly to land, our ancestors, and the natural abundance available when we tune in to it. 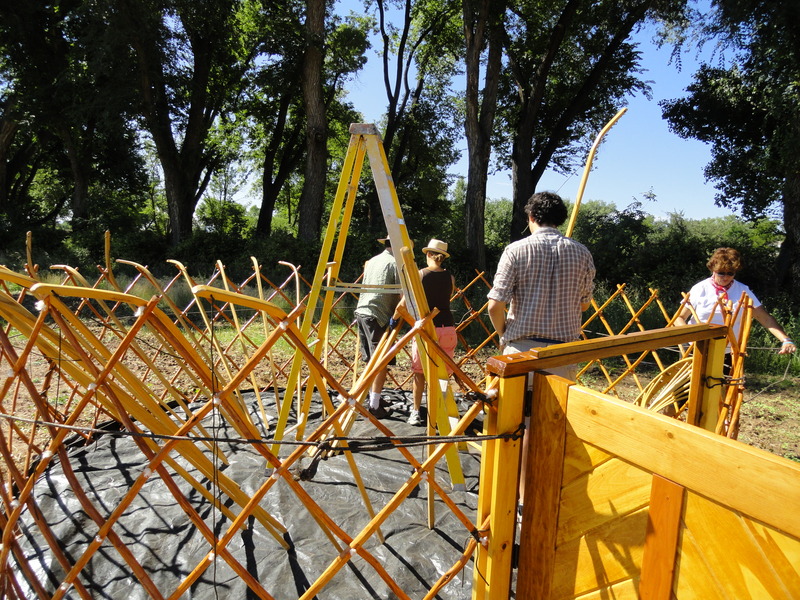 The first task was to set up the yurt. Sean, the resident farmer, had cleared a spot in the fallow field. Volunteers Victor, Terry, Patrick with his partner, and Donna were recruited ahead of time by Nancy and we all pitched the yurt using a kind of swarm intelligence, like ants going this way and that, but somehow achieving the goal nonetheless. After resting a bit, I made a batch of organic chocolate chip cookie dough and fired up the solar oven to bake treats for afternoon visitors. The cookies were bait to entice guests to linger and share stories of their ancestors. Who were they? Where did they live? How did they provide food for themselves? What has changed since those days? Binah and her friend Jim were the first cookie-eaters. This new friendship with Binah, an amazing fiber artist, has amplified my understanding of fiber as an artistic gateway to sustainability, as I indicate in the post “Felt from the Fibershed.” Binah is all about color. Anticipating the felting workshop, she brought some amazing silk made from sea shells – lustrous and dyed in luminous colors. She told of her immediate ancestors who worked shucking blue crabs in Maryland. At age 6 she visited her aunt’s farm with its bulls and pullets. Her mom dressed Binah and her sister well, in red and white gingham which to Binah seemed out of place on the farm. Nonetheless, she connected to the farm through her “color memory” and recollected how they supported themselves with food from the farm, which involved killing chickens to eat. This direct action empowered Binah to identify as an artist with passion for color and a drive to make things. 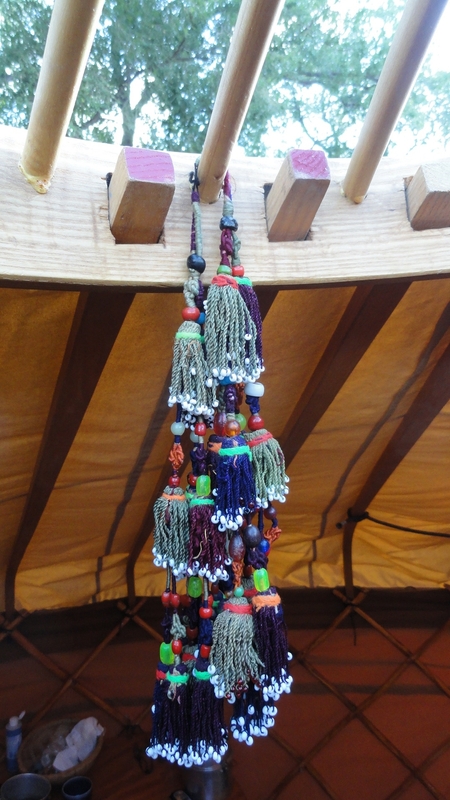 We have an outstanding agreement for her to teach me to make yurt tassels, similar to the Uzbek ones that hang from the hoop. The next day she would return to make felt under the eaves of the farm store. For dinner, I gleaned purple beans, cherry tomatoes, and a melon from farm rows that were slated to be uprooted the next day. With asadero cheese, salad dressing, and yogurt, they made a healthy raw dinner salad. Somehow I relished the milk proteins more than usual and could see why Asian nomads eat kurds so much. After the harvest I spoke with Christina, the goatherd who operates a livestock concession at the inn. She has worked every day for three years straight, without a break, because she doesn’t want to risk the animals’ welfare to anyone else. The goats are milked twice a day and are part of a diverse lot of farm animals including meat goats, a few pigs, geese, a Guernsey cow, chickens, ducks, and some specialized creatures including a lop-eared rabbit that babysits the kid goats. She adopted a mini-mule named Colorado named for his clay-red coat. He was orphaned by his mini-horse mom and mini-mule dad. He was born with mangled legs and despite the vet’s recommendation to put him down Christina nursed him back to health with goat milk. The lop rabbit gets to run around the barnyard for 30 minutes a day and then returns on his own to ask for a nap. He gets wiped down two or three times a day to cool off and otherwise is on duty to care for the goat kids. 9:00 – Made yogurt with fresh goat milk. I scalded the milk first, charged it with culture from yesterday’s cow yogurt, and nursed the batch to keep it about 105 degrees Fahrenheit throughout the day. The yogurt set up nice and firm, leaving no whey, unlike my results with cow milk. Solar noon – Made a solar casserole with quinoa, rice, lentils, tomatoes, purple beans, carrots, onions, cumin and paprika. The oven reached 290 degrees after a slow cloudy start. 1:30-3:30 – Set up the felt workshop outside the farm store. Today there weren’t any official participants except me, but farmer Sean and his then finance Mimi, who he married a week later, were very interesting and we all had a good chat. Mimi has two Masters Degrees. She was a therapist but got out of that in favor of working in the farm store. Their goal is to have their own farm. Sean’s background is in communication and journalism. 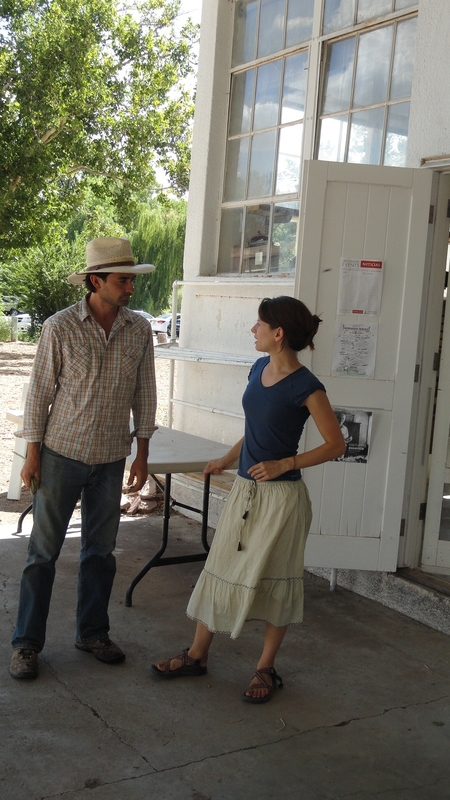 He has worked out of the country and lived off the grid for a while in southwestern New Mexico. He gave me a tour of his indigenous crops – peppers, sunflowers, maize, tobacco from various pueblos, devil claw used for basketry. 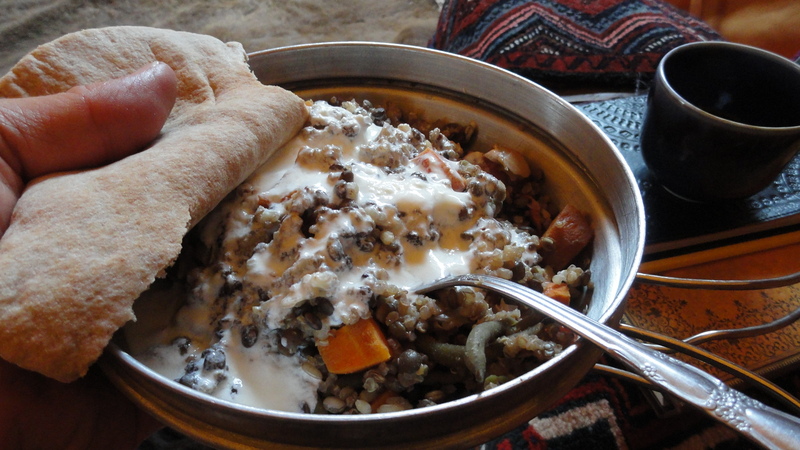 Dinner that evening was simply the lunchtime pilaf with a heavy dose of fresh goat yogurt. Just as I was eating and wondering why I felt alone, my wife Diane showed up for a nice visit. We went over to see the goats and Christina explained her mission is to support an enormous diversity of breeds, with one of each type it seems. Sometimes Jonathan, the Inn’s master chef, chooses a meat goat to be butchered, or some hogs. 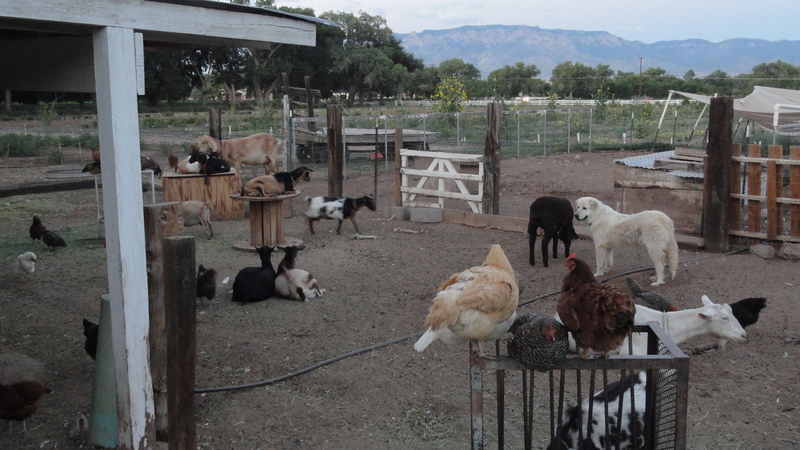 New Mexico is notoriously shy on infrastructure for local food production, so the animals are shipped in the dark of night, while it is cool, to a humane slaughterhouse in Durango, Colorado and the meat comes back again down the road. Later that evening when everyone was gone, I looked in on the livestock to find the big, white guard dog playing a friendly game of tag with two goats. Let’s talk about meat. My greatest departure from real pastoral nomads is that I’m about 99 percent vegetarian, shifting toward vegan. But I obey my body’s cravings, so when it says “red meat” about two or three times a year, I go for bison. When I crave fish I choose wild salmon. So, it is not surprising that between: (1) trips this summer that put me voluntarily with my foodshed field school students on the killing floor of humane slaughterhouses; and (2) seeing life itself in the curious, feeling eyes of pigs, goats, sheep, cows, horses, and dogs, I cannot justify the deaths of billions of animals each year to support luxury meat consumption. Across the globe, meat consumption per person increases steadily with GDP per person. Yet, a protein deficit that we expect to see in a truly impoverished land can be eliminated with very modest meat consumption. Beyond that, higher consumption courts inflammation of the arteries, obesity, and other afflictions. From the standpoint of animal welfare, documentary films such as Food, Inc. bring my classes to tears when they see for the first time the plight of factory farmed chickens and swine. The Qur’an teaches Asian nomads to look after their livestock, who they know on a first-name basis. Let’s learn from our nomadic colleagues about moderation and humane treatment and find ways to make that our practice. Back in the yurt that evening, inspiration hit. What if we designed a rigorous food curriculum for schools to teach about horticulture, agriculture, nutrition, cooking, and financial planning so families could afford the food they deserve? Let it include laboring on farms to learn what our anonymous food providers go through. Let students discover the satisfaction of nurturing plants and animals and come to know the value of basic, traditional foods. Let them see the intricate network that constitutes a thriving localized food system, see it as a path to rewarding, meaningful careers in foodshed development. Let it include hands-on, respectful slaughtering of livestock, followed by cooking and eating, so that students gain insight into the biological interdependence that gives us life. Then, students would really know where food comes from. Give students the information to creatively sculpt their food habits. Knowledge of this sort gives freedom and self-determination for better long-term health outcomes. Epiphany! It was actually a gift when the Native American told me last June that my yurt “is a hogan.” Now, as I photograph the yurt in the early evening light, I revel in the beauty of its wood, the genius of its design, the outcome of cumulative improvements contributed by countless inhabitants, a pre-internet open-source solution. It carries a legacy of ingenuity and function, of strength through seasons and centuries. It is at par with the hogan. Now I shift to see my yurt as the legitimate offspring of a global heritage of indigenous architecture – durable, affordable, biodegradable, fit to the environment, made of materials from this place. I feel connected to ancient times when we were secure and grateful in mundane awe of being. We made our home as we learned to do from our parents. We were free to take it where we needed to be. We loved the sun on the clouds of early evening because we could see the rain building there. We did not know our house was small because there were not houses bigger than others. Without disparity, we could not envy others for their wealth. Wealth was in the natural abundance of sun, water, grass for livestock, food on the hoof, family and friends around us. Is this too romantic a notion, given the inevitability of drought, famine, war? No, there really are times of peace and plenty, satisfaction and sanity. Life on this farm is a solar day and a lunar night. I wake to the surprise of being in the yurt. The day seems pushed by the sun. I welcome the peak heat of the day, knowing it will pass, giving the gift of coolness, a meal, and rest. The solar day is not ruled by people – we flow with its pace trusting that the cycle of days, then seasons, then years will take us along. We are voyagers equipped to reside among others wherever we find ourselves.